Hey everyone. I've got a few important things to say. Check below for that. A few people have emailed in to ask why there was no Auburn story in today's editions of the Montgomery Advertiser and on the web site. I wrote a story detailing Tommy Tuberville's proposed extension and all that. I received the information from two different people, legitimate people with legitimate knowledge of the situation, but wasn't able to get that story in the newspaper. Here's why: The Advertiser doesn't use unnamed sources under any circumstance. I can't write "sources said" or "sources confirmed" or "said a source familiar with the telephone call". I have no problem with reporters who use unnamed sources. I would if I could. The Advertiser's policy doesn't allow that, so I'm stuck basically praying that one of these sources is willing to go on the record. They generally don't do that in situations like this. They're not willing to sacrifice their careers just to be on the record in the Advertiser when other papers afford them anonymity. 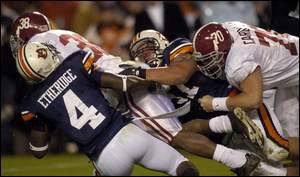 Now you know why there was no Auburn story in the Advertiser this morning. I'm sorry for that. I know some of you rely on the HABOTN (and me by extension) to provide you with the best Auburn information. I promise to keep working to make that happen. Hey everyone. Today has been a breeze after what was a nutty Thursday night. Tuberville returned from his hunting trip as planned. It appears that the stunning report out of Arkansas last night wasn't credible. Auburn called coach Tommy Tuberville this afternoon and relayed the terms of a revised contract. A copy of the proposal was placed on Tuberville's desk after lunch. Auburn is looking to extend the deal back to the initial seven-year term and is including a modest raise. It's unclear how Auburn plans to assuage Tuberville's concerns about facilities. Athletic director Jay Jacobs and Tuberville will meet again early next week. Hey everyone. Tremendously busy day as you'd expect. Let's get to business. You know what that 6 is for? They want to buy out Tuberville. Only takes $6 million. You don't need a reduced buyout to shut us up. A new MacBook would do the trick here at the HOTTEST Auburn blog on the 'net. It's been an absolutely crazy night of awkward comments and developments. It's matched only by the night Jetgate broke and the afternoon of 10/23/98 when Terry Bowden resigned. *Auburn has not been contacted by Arkansas. *A Ft. Smith, Ark., television station is reporting that Tuberville will be the next coach at Arkansas. *Tuberville's weekly appearance on "Tiger Talk" included a long rant about how the program can't progress if it continues along its current course. He later made references to the need for upgraded facilities and to get the attention of "people in charge"
*Tuberville is in Arkansas hunting ... animals. 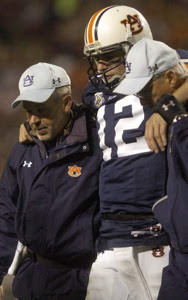 *Auburn is planning to offer Tuberville an extension Friday. *Where the Arkansas television station got its information, which is premature at best. *Why Tuberville is taking his opinions to the airwaves. *Whom Tuberville is identifying when he says "the people that are in charge." ``I want everybody, not just our administration but also our fans, to understand we are at a point and if we are going to get to another point we can’t keep on as is. You've got to make changes -- facilities. You have got to have a plan. A plan has to be intact." ``I am not looking to go anywhere. I am looking to make sure people understand what we need to do to get better. This program needs to take some steps in some areas to improve and some need to be talked about with our president, who is a great guy, and we had a great visit, and also Jay Jacobs, our athletic director." 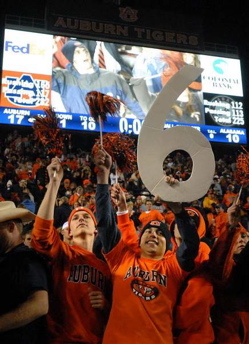 So what does your favorite Montgomery Advertiser Auburn beat writer think of all this? My initial thought is that a rift absolutely exists between Tuberville and at least a few of "the people that are in charge." It looks like he's playing a game of chicken. He's taking jabs on "Tiger Talk" and dragging his feet on these talks with Auburn. Is that the kind of behavior you'd expect from a coach who allegedly is content with finishing his career at Auburn? I wonder what "Michael S." (see the 11/28 blog) thinks about all this. Hey everyone. News has been pretty scarce. As you can see from the newspaper reports of late, insiders clearly have different perspectives of what has happened with Tommy Tuberville and what will happen. I'm still of the opinion that Tuberville will be Auburn's coach next season, but it's obvious that this isn't a cut-and-dried deal. We're buyout-free. 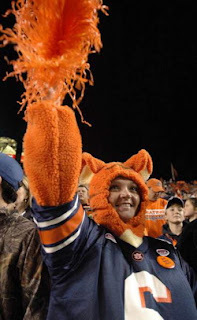 We're the HOTTEST Auburn blog on the 'net. Reiterating what I said at the top, there wasn't much going on at Auburn today. Tuberville didn't make it into the office today for a second day of talks with athletic director Jay Jacobs. What does that mean? Debatable. It's clear that Arkansas at least some token interest. Does Arkansas want to pay that $6 million buyout just to get to a point where it can offer him $2.75 million +? That's a lot of money for a guy with one conference title to his credit. Tuberville is planning to be out of town on Thursday. Talks will resume ... later. If you're wondering about the picture, I'll never pass up a chance to get ace trainer Arnold Gamber (at left) in the HABOTN. Franchise player? I think so. OK. Fun stuff. At the Maryland-NC State game last weekend, official Ron Cherry (who handled Auburn's Capital One Bowl game in 2005) called a personal foul on Kalani Heppe for "giving him the business." A lot of young'uns think that was Cherry being inventive. It wasn't. That was a shout-out to former NFL official Ben Dreith, who (mistakenly) busted Mark Gastineau for giving Jim Kelly the business during a 1986 game. He hasn’t made a concrete statement? I am glad you found journalism because anything that required half a brain was out. Hey everyone. I'm back for more breathless coverage of Tommy Tuberville's negotiations with athletic director Jay Jacobs. I wish I could broadcast this stuff for you guys because I KNOW it would be the most listened-to program in the state today. You'll have to settle for a summary. Or maybe not. It depends on what the two parties decide to say afterward. 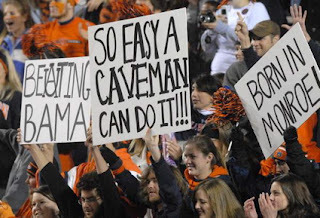 You don't have to make $4 million to read the HOTTEST Auburn blog on the 'net. It'd be nice, though, if you'd go ahead and leave cash at our doorstep if, let's say, you did make $4 million. You don't need all of that. Really. You don't. Jacobs and Tuberville spent most of the day talking privately about the coach's plans for the program. The meeting broke up during the late afternoon, around 5, without a resolution. They're going to resume the chat in the morning. No news yet. One thing I find interesting is the sentiment from some Auburn fans who think Tuberville deserves a raise. Guess what? He's getting a raise. The contract stipulates that he gets an extra $200,000 each year, meaning he'll make $2.6 million next season. As Press-Register ace Evan Woodbery noted earlier, Tuberville will average $3.1 million per season during the final four years of the contract. That's pretty good money by any standard. Only a few guys -- Saban, Oklahoma's Bob Stoops and Iowa's Kirk Ferentz -- are in the $3 million club right now. Remember, though, that Pete Carroll and Charlie Weis aren't obligated to reveal terms of their contracts because those schools are private. God bless Houston Nutt. One day after resigning at Arkansas (with a $3 million buyout), Nutt accepted the job at Ole Miss. Brilliant move on both ends. Nutt is an 8-4 coach now at a program that will appreciate 8-4. And he's rich. The Rebels are about to improve. So everyone wins. Agent Jimmy Sexton also wins. He represents Nutt, Tuberville, Saban ... surely A-Rod in the coming months. Robert Cade, founder of Gatorade, has died at 80. He and few homies from Florida unintentionally started the whole sports-drink phenomenon in the mid 1960s. It's one of my favorite stories of all time ... that some lab guys, with totally atruistic motives, concocted a drink to make the football players better able to handle exercise. Maybe it's because my dad is a lab guy. I could totally see him doing something like that. BREAKING NEWS: Tommy Tuberville, university president Jay Gogue and athletic director Jay Jacobs met this morning at Samford Hall for the coach's season-ending chat. No major topics were discussed. Tuberville will meet privately with Jacobs later this week for a more substantive discussion. I expect this situation to be wrapped up -- one way or the other -- by the end of this week. It's looking more and more like Tuberville will be at Auburn in 2008. He doesn't want the world. He just wants some perks that seem reasonable for a staff that just built Auburn's longest winning streak against Alabama. I think they'll get most of the stuff they want. There will have to be some concessions made on both sides, but I expect a middle ground to be found. He'll make $2.8 million next season. It's not like he's struggling to eat. He knows that. Hey everyone. So you read the breaking news. That's pretty much what's happening around the Complex today. I'll be back tomorrow with more coverage of this awkward back-and-forth story. We're bruising through the news like Clubber Lang here at the HOTTEST Auburn blog on the 'net. Now it sounds like Houston Nutt may be out at Arkansas, which would follow what I heard was his plan all along. ESPN says the buyout will be $3.5 million. Perfect for him. Now he can throw that in the bank and go make $1 million coaching 'em up at Georgia Tech, SMU, Baylor or, heck, why not Ole Miss? Texas A&M has hired Mike Sherman as its next head coach. Tuberville wasn't a serious consideration. Chan Gailey has been fired at Georgia Tech. I guess back-to-back wins against Auburn wasn't enough to save his job. Oh, wait. That was four years ago. If I was Dan Radakovich, AD at Tech, I'd hire Will Muschamp. Not Nutt. Hey everyone. Only a month until Christmas. 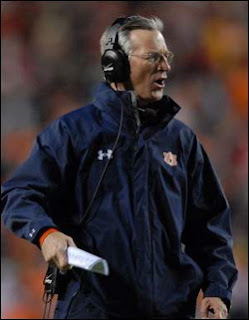 I know what Tommy Tuberville wants, though I'm not sure if he belongs on the "naughty" or "nice" list. I'm glad I don't have to make those kinds of decisions. He got his sixth win. That's a major accomplishment, one that will endear him to fans forever, but I'm not sure it's going to bump his salary beyond the $3 million threshold or anything. We'll just have to wait and see. Thanks for falling in line with the millions before you by visiting the HOTTEST Auburn blog on the 'net. It doesn't sound like Tuberville is a candidate at Texas A&M at all. The Houston Chronicle reported today that Tuberville wasn't seriously considered at any point. The school apparently wants Houston Texans defensive coordinator Mike Sherman. That's news that Tuberville probably doesn't want out there a day before he talks things over with his boss. Oh, yeah. Tuberville and Jacobs are supposed to meet on Monday for their little pow-wow. If Tuberville is serious about staying, he probably will emerge from that meeting with some conclusive ideas about his long-term future at Auburn. Arkansas may end up as another job option for Tuberville. I'm still not sure on what will happen there. I hear that Houston Nutt wants out, wants that hefty buyout, so he can cash out and coach somewhere with less pressure. Some important administrators still are sold on Nutt, though, so that could be a weird situation. Not sure Arkansas is a step up from Auburn. I'm just passing along what I have heard. CB Jerraud Powers was bitten by a police dog during the Alabama game. I cannot tell you how angry I would be about this if I was Powers, Tuberville or anyone associated with university administration. Impossibly silly. I can see why K-9 units could be useful in certain situations, but guarding the goal post during the game probably isn't one of them. Cash money says this is a case of those law-enforcement guys wanting a good seat for The Big Game. Now the team's best defensive back has a puncture wound from being bitten by a dog during a game. How dumb is that?